Saturday. The day of sleeping and getting much needed rest from yet another exhausting work week. I will be the first to admit that my workdays were not filled with time-sensitive stressful projects, but I will say that if I look at another spreadsheet or have to type up another long-winded document, my brain might actually shut down while I crawl away whimpering. Thank god I have life outside of work to escape to! The greatest escape I have is creating art. Art is the one of the few places that I can get lost in the “zone”. The “zone” is where almost everything around me sinks into the background and only me, my pen, and paper exists. Sure sometimes I am forced out of my “zone” and back to reality, but at least for a few moments I am free of all worries. 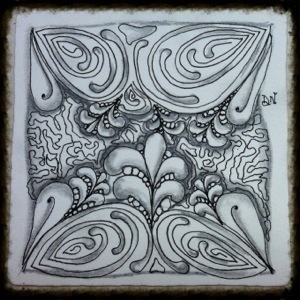 This brings me to the true point of this post- my Day Six, Creation Six Zentangle tile! Let me say I absolutely loved creating this one! This tile used some of the best tangles I have learned to date. It features the flowing beautiful lines of “Mooka”, the leaf and pearl shapes of “Flux” and the squiggly lines of “Amaze”. As always I hope you “like” this tile as much as I do!